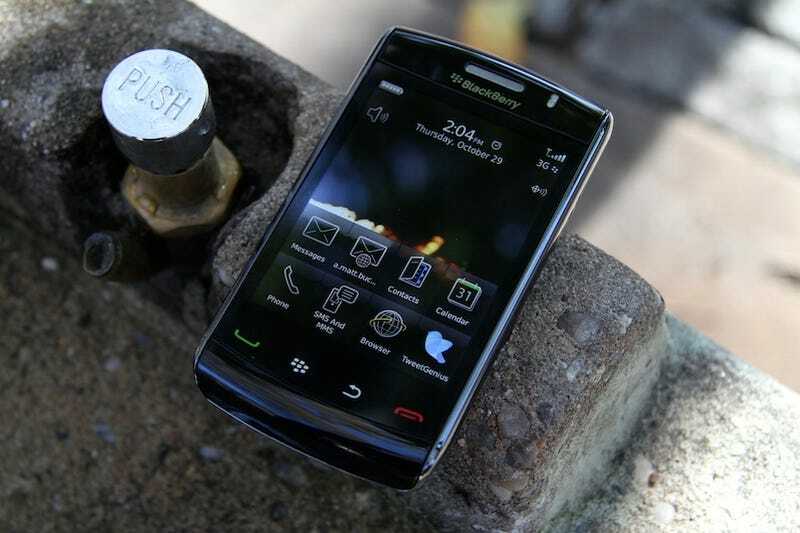 Take the BlackBerry Storm. Now imagine a phone that's basically exactly the same, but does everything better. That's the Storm 2. It's the same phone, essentially, just refined in nearly every way. It's not the Storm reinvented, it doesn't shoot lasers, and it's not going to kill anything. It's just better than before. SurePress, RIM's "the whole screen's a button!" touchscreen technology, lives on. But now it's four buttons. Four piezo-electric buttons that live under the screen, to be precise. What that means for you is that wherever you press on the screen, it feels way more localized, like the screen's only being pushed in exactly where you click it. Before, it was like the whole screen was on a see-saw. The re-balancing of the screen lets you go far more smoothly and efficiently from one letter to another while typing, rather than waiting for it to pop back up every time. A software change—which is available for the first Storm too—enables true multitouch typing (for two fingers, but that's enough). You can actually take advantage of the new screen and type much faster than you could on the original Storm. In other words, the mechanics of SurePress actually work now. The entire build of the mechanism is less janky too—the giant chasms between the screen and the rest of the phone begging for turkey jerky bits to get sucked like a gaping maw have been closed, and the four main buttons are now a seamless part of pushscreen. Oh, and one clever touch is that the screen's dead stiff whenever the phone's off—if it doesn't press down, you can tell the phone's off (though it does mean one less thing to fiddle with). SurePress, while vastly more usable and comfortable now, is still flawed as a touchscreen navigational concept: It's predicated on literally putting an obstacle in front of you that has to be smashed in every time you want to do something. It's not an optimal experience. And it ultimately fails in what it supposedly sets out to do by "separating navigation from confirmation," to use RIM's verbiage: To make you type more accurately. It just makes you type slower and wonder why you can't use the Storm's quite dandy touchscreen like any other touchscreen, since the keyboard and screen are otherwise great. The Storm 2 is quicker all around. The response of nearly every element is just so much springier than the first Storm—I'm talking versus the launch software to be clear, since frankly, that was the last time I used the Storm. Apps pop up instantly most of the time, hang-ups are a rare occasion, the accelerometer kicks in quickly to rotate the keyboard, and it moves with the kind of speed you expect it to. The phone feels way more like it should. This extends in some respects to the browser, too, which seems a little more capable—though by no means as stacked as a WebKit browser. I wish the camera was faster to start up though; it's still sluggish most of the time. There are a few slight visual tweaks to the OS since last year as well that make it more look more polished (I'm very surprised I noticed). For instance there's a more matte, almost Apple-like gradient for highlighted items, like in Messages. Icons are a little more sober, which reflects the darker, slightly more understated look of the phone itself. My favorite software tweak is probably the true QWERTY keyboard in portrait mode, instead RIM's SureType system that previously foisted in front of your thumbs. It's better than Android's—and HTC's reskin of Android's on the Hero—though not quite as good as the iPhone's. While it's got a speed boost and a bit of extra iconographic spitshine, it is still fundamentally the same experience—the Storm 2 touchscreen interface still feels like it was designed by people with physical keyboards soldered into their brains. From the grand scheme of the UI, the standard BlackBerry setup re-jiggered for touch rather than a ground-up design, to the BlackBerry apps that clearly aren't designed with Storm in mind, there's a definite sense of non-belonging with the Storm 2, like when all of the puzzle pieces don't quite fit together and you jam them together to make it work anyway. In other words, it tries real hard to be a touch phone and a BlackBerry, but it doesn't do either of them exceptionally well. The Storm 2 is where the Storm should've started, but at the same time, it's coming into a different world than a year ago—even on its own carrier—where not breaking new ground is simply moving too slow. More than that, while the Storm is overall a good phone, unless you have a very specific set of criteria for your phone—that is, a touchscreen BlackBerry—you probably shouldn't settle for a phone that doesn't do the touch or BlackBerry aspects (read: typing) spectacularly. There are phones that do each of those things better. If you want a BlackBerry on Verizon, get a BlackBerry Tour, which has an awesome keyboard, if a few trackball problems. If you want a touchscreen smartphone on Verizon, you should get a Droid. At least, that's how it's looking so far—come back early next week for our full in-depth Droid review.